Rarely if ever has Drouot seen a collection like this. Starting on 11 December, the dispersion of the 1,600 books in Pierre Bergé's library looks set to be the most glittering sale of this genre in modern times. On the first day, 188 are going up for sale, featured in a limited-edition catalogue in autumnal shades, with Alexandre Wolkoff as artistic director and photographs by Stéphane Briolant. Over the next two years, five other sessions will be devoted to the library by auctioneer Antoine Godeau, seconded by experts Stéphane Clavreuil, Benoît Forgeot and Michel Scognamillo, in association with Sotheby’s for its international promotion. 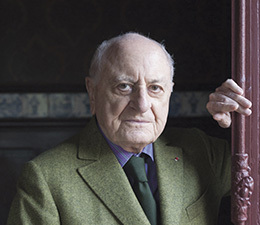 A month before the sale of his library at Drouot, Pierre Bergé told La Gazette of his intention to withdraw four books so that they could go to public collections. The first sale of Bergé's library will be far more than the event of the year for the art market. "Faithful to his actions as a patron," says auctioneer Antoine Godeau, "Pierre Bergé intends to withdraw four major lots from the sale, so that they can go to public heritage collections." These are: the first manuscript of André Breton's “Nadja” (currently being classified as a major cultural heritage work), the proofs of “Les Poètes maudits” corrected by Verlaine, Chamfort's “Maximes et pensées” annotated by Stendhal, and lastly a first edition of Émile Zola's “Le Docteur Pascal”, which contains an affectionate envoi to his mistress, Jeanne Rozerot. The average estimate for the four works is €3.7 million, i.e. a third of the estimated total of the sale. 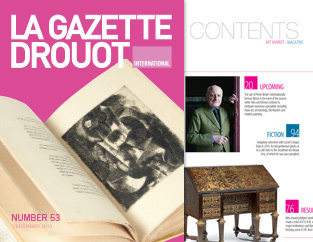 After the success of the first edition staged in June this year, which posted magnificent results, Drouot is setting its clock to Asian time again. For around ten days, the celebrated Paris saleroom is laying on a selection of sales dedicated to the arts of Asia, particularly China: a glittering speciality in France for the last decade. For this latest session, the auction houses joining forces at Drouot are presenting a choice selection, largely dedicated to Buddhist statuary, porcelains and textiles. Loa Haagen Pictet, the collection's curator, is also the president of IACCCA, a federation of several corporate collections. She has it all: beauty, a keen eye, an impressively varied career and considerable experience. Danish-born Loa Haagen Pictet had a brilliant academic career before deciding to focus on museum work. As part of France/Korea Year, the exhibition explores the work of contemporary designers in a country whose culture is still largely unknown, trapped between the giants of China and Japan. To fully appreciate the section of the exhibition "Korea Now!" dedicated to design and crafts, you need to leave a number of Western assumptions in the cloakroom. Photography, particularly in the digital age, lends itself to reproduction and publishing more easily than any other medium, rendering it the most accessible art form. And so, the notion of rarity, which contributes greatly to the value of such works of art, (in so far as they are works of art, as according to European legislation, a photograph is a work of art if there are fewer than 30 copies made) seems to be lacking in the medium and only able to be introduced artificially. With over 200 objects loaned by Europe's largest public collections, the Musée du quai Branly presents a prolific output from the banks of Papua New Guinea's Sepik River. On numerous occasions during the 19th century, travellers journeying along the island coast of New Guinea, north of Australia, noted how, at a precise location, a change in the sea's colour and floating bits of wood indicated the presence of an immense river, though its mouth was invisible.